A quick and easy way to rhinestone shoes! I have always loved sparkle in my life. I wanted to jazz up some of my girls flip flops for the summer. I ordered some size 16ss rhinestones from www.rhinestoneshop.com. He ships very quick and he is the cheapest I have seen. I used about 1 gross (144 rhinestones) per pair of shoes. Use the other end of the stick to apply E-6000 on to the shoe. Don’t use to much glue or it will get all over the rhinestones and make them “cloudy” or dirty. Use the beeswax on the stick to pick up the rhinestone and put them in place. I did a cute flower design on the pink shoes and then I covered the silver shoes in crystal rhinestones. With this technique I can bust out a pair of shoes in about 15 mins! If you are short on rhinestones, get a cute ribbon make a bow, then rhinestone a button for the center. Hot glue the bow onto the top of the shoe and you are good to go! I love being able to dress up a pair of plain Old Navy flip flops! so cute, I love the black one! Cute! I love this kind of stuff; it’s perfect for coworkers or teachers for a little summer happy! these are so adorable, what a great idea. I hope you’ll add this to my What We Wore, Read and Made party. What a fun Idea!!! Now my husband is going to see me gluing my flip flops and he wont even want to ask! haha! So cute! I totally needed this. I finally threw out my rhinestone flip flops so this is just in time! Cute flip flops!! I really like the black ones with the little bows! What a great idea. I LOVE the rhinestone heart. That is awesome. And the wrestling shirt, you will rock when you wear it to tournaments. Hey Mallory and Savannah this is a great DIY project and thank you for using Rhinestone Shop. We love highlighting great ideas and projects like these on our blog. We would love to possibly highlight another one of these great projects on our blog. Please let me know if you might be interested! 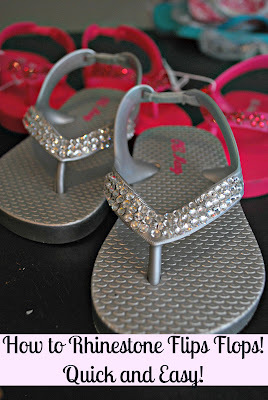 The flip flops with the bows and rhinestone buttons are so adorable! Such a great idea. It’s just awesome. I love all the ways you described. Learned some new things today.